How Many Inches Is an Adult Giraffe's Tongue? Giraffes are the tallest land animals and have tongues to match. If you’ve ever visited a zoo that allows you to feed the giraffes, like the Cheyenne Mountain Zoo in Colorado Springs, you know firsthand that these creatures’ tongues can extend far from their lips to wriggle and grip a snack. In the wild, their 18- to 21-inch tongues help them reach leaves in tall trees that they consume to fill their 1,100- to 1,800-pound frames. The acacia tree features long thorns that prevent many animals from enjoying it in their regular diet. The length and agility of the giraffe’s tongue enables it to navigate around these thorns to get at the leaves. Along with a long tongue, giraffes also have prehensile lips that can grasp like hands and assist in getting the leaves off the trees and navigating around the thorns. 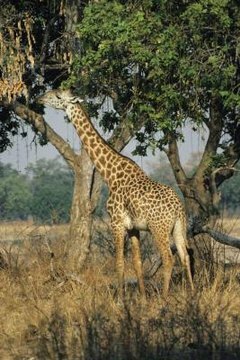 Giraffes are partial to a specific type of leaf that comes from the acacia tree. They need about 75 pounds of these leaves to give them enough energy for one day. Their tongues enable them to get just a few leaves in each bite, so the majority of the day is spent getting the leaves off the trees. In addition to being long, giraffes’ tongues are shaded dark gray – almost black. Only the visible 6 inches of the tongue is this dark color, the inner part of the tongue has a more expected pinkish hue. The San Diego Zoo explains this is possibly a way to protect the tongue from the sun as it reaches for leaves. Giraffes' tongues help them miss thorns in their favorite trees, but if they happen to get one into their mouth, they have added protection. Their mouths and lips are leathery to prevent piercings. They also secrete a sticky, thick saliva that coats any thorns that make it past their tongue and lips. What Do Red-Shanked Douc Langur Eat? How Do Giraffes Protect Themselves? What Kind of Climate Does a Giraffe Live In? What Things Do Kangaroos Eat? What Adaptations Help a Monkey Hunt Its Food?